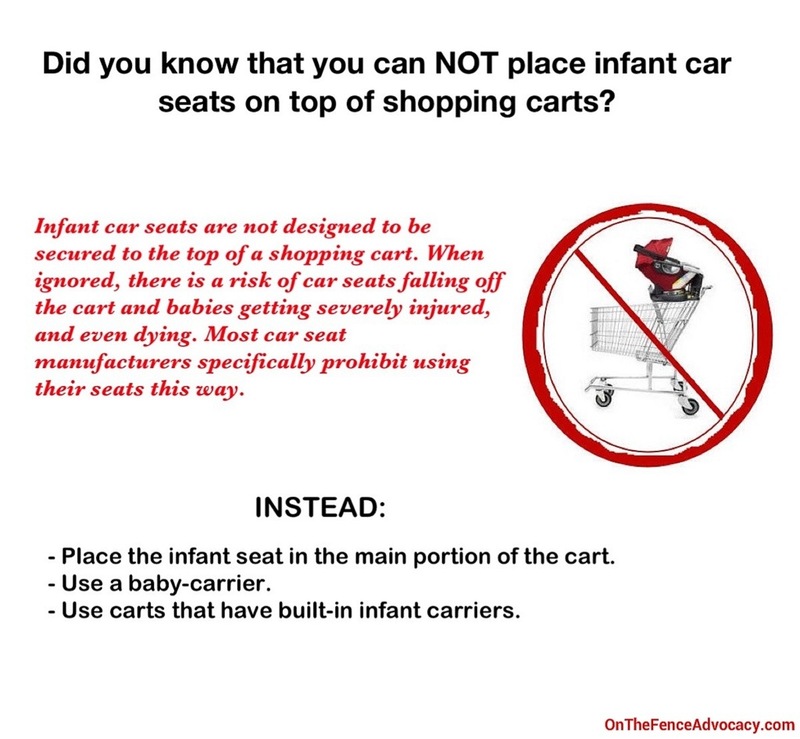 Time for another reminder about NO car seats on top of shopping carts. “I see this ALL. THE. TIME. I know you must see it too. Perhaps you’re even guilty of this yourself. Here’s why it’s such a concern and what you can do to reduce the risk of your baby being seriously injured in a fall off a shopping cart. The problem: Infant carseats aren’t designed to be secured to the top of a shopping cart. Most carseat manufacturers specifically prohibit using their seats this way but that warning is usually buried along with 30 other generic warnings in the instruction manual so it doesn’t get much attention. Plus we’re a monkey-see, monkey-do society, so many parents think this is a perfectly acceptable practice. The issue is that the carseat isn’t strapped in or snapped onto the cart. It’s just perched on top. Sometime it’s perched in a way that’s fairly stable but more often than not, it’s just teetering on the top with little support. One good bump and that seat (with baby inside) is going to topple. If baby is old enough to kick, grab or try to sit up – that increases the chances of falling. If the baby is old enough to kick, grab or try to sit up and the harness straps are loose, or worse yet – not buckled at all, that greatly increases the chances of a fall. And if you have a preschooler shopping with you – the chances of baby toppling off the cart just increased ten-fold. In case you haven’t noticed, little kids like to push the cart, climb on the cart and hang off the sides of the cart as soon as you turn your back. The cart isn’t the most stable object on 4 wheels to begin with, so adding a toddler or preschooler into the equation can be a recipe for disaster. The Reality Check: You gotta put the little critter somewhere and wearing him or her while you’re trying to shop isn’t always practical or convenient. Here are some suggestions for making a trip to the store a little less hazardous for your baby. Use common sense! If the seat is poorly supported (as in the picture above), don’t leave it that way! Nothing you’re going to buy at Costco or Target or ShopRite is worth risking your child falling off the cart face first. You can also put your baby in a sling so that you have your hands AND cart free while you shop.